A Nigerian man has taken to social media to express his disgust after seeing a 13-year-old boy buying 4 bottles of beer to drink while watching a football. According to the man, the boy disclosed that he has been coming to the bar with his uncle, since he was 11. So i was in a meeting with friends at a bar in benue and dis young boy bounced in with so much confidence sat and ordered for a bottle of beer..As an African man dat i am it was difficult for me to ignore coz the question i asked myself was what if he was my kid brother?? Then i asked him how old he was he smiled and said brother why u ask,I then replied saying coz u look too young to be here and he then said am 13years old but av bin coming hia with my uncle since i was 11.. In shock i asked again how he got the money then his countenance changed like i was asking too much questions..So i walked back to my sit video taped how he ordered for four more bottles,swinging his legs,watched his match n digested it all with a coke bottle ..Now am really getting scared for this generation coz we don’t pay attention to dis kids anymore..Parents please look out for your kids, the friends they keep and the things you do in dia presence..For the youths our love for money shouldn’t make us ignore our morals. 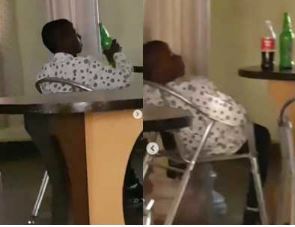 The post Nigerian Man Shocked As 13-year-old Boy Buys 4 Bottles Of Beer To Drink (Watch Video) appeared first on Naijaloaded | Nigeria's Most Visited Music & Entertainment Website.